AccessJ: Japanese TV Variety Shows: Shinkonsan Irasshai! Among the dregs of Japanese television, I have a guilty pleasure. Aside from NHK morning news and those relaxing nature shows (of which I'll write shortly), Japanese TV seems pervaded by questionably acted soap operas and, I think, essentially one cookie-cutter variety show whose shiny chrome finish wears off after you've seen its formula repeated over and over for a few months. Enter the guilty pleasure. I know that this show I'm about to introduce is just the same thing over and over again. I know it fits the variety show pattern almost to a "T" (--it's only missing the wipe.) And yet I cannot get enough of it. Aside from dry wit I import from home (in quantity to match the local schedule's dearth), it may be the only thing playing on my screen to which I audibly laugh. And laugh I do, with consistency, occasionally to the point of tears. The show isn't new to old Japan hands. In fact, it's about to enter its 43rd year, the same guy hosting the show since its debut in 1971. 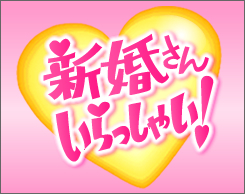 It's a pretty basic model: The host, Katsura Sanshi, and his assistant, Yamase Mami, invite two recently married couples to, over the course of a 30 minute episode, tell the story of how they met, fell in love, and got married, then talk about any problems or idiosyncrasies of their newlywed lives. 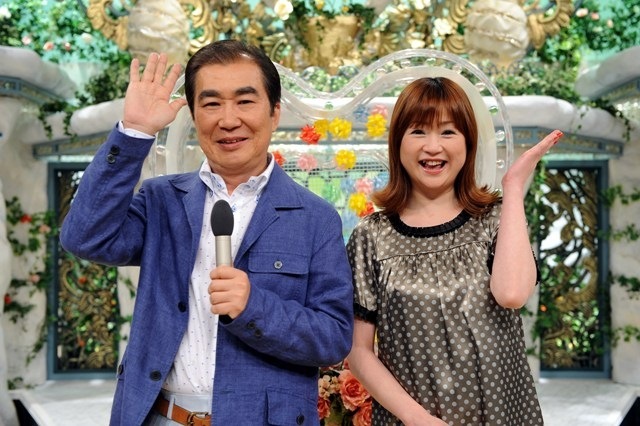 At the end of the show, the couples can win a prize. Rinse and repeat. If you watch the show several weeks in a row, you'll soon realize that even the commercial breaks feature exactly the same commercials in exactly the same order every week. So what keeps this show interesting? It's the people that come onto the show. From the host's uncannily perceptive questioning, it's clear that everyone involved has either briefly rehearsed the interview beforehand, or Mr. Katsura's been given a bulletpoint biography of the couples' intimate (and absurd) secrets, but the pungent twinge of reality remains among the trite talk show setting and recurrent gags. Yes, this guy really did propose to his future wife by handing her his bankbook--on their third date. Yes, this other guy really did move in with his wife's family only to find out that they all lounge about the house naked all the time. The stories that get painted are so vivid that they've stuck with me for months after the episodes in question. That was great! Thanks for talking about that. I'm totally hooked now.